Discussion in 'Amps and Cabs' started by thecasterkid, Dec 7, 2016.
onetracker, stratpaulguy86, PurpleJesus and 2 others like this. If he moves a bunch, cool! I saw this post as well and immediately thought of the EC and Edge sigs... If I wanted either I'd just build or get someone to build one for me. Guy in town makes a killer HP and LP twin. Holzar88, JPIndustrie, massacre and 3 others like this. Cool amp but usually tweeds don't do well with master volumes so not practical to me. Forgive my ignorance, but how do you know it has a master? I assume this will be hand wired? Poorly written on my part. I should have said that since tweeds usually don't do well with masters volumes I'm assuming this one doesn't have one. Probably a cool amp if Joe had an hand in designing it. He's been using Tweeds for awhile and knows how to get killer tones through them. Good for him! lespaulnmarshall, blues and BMX like this. I see volume 1, volume 2, treble, bass, middle and presence, power, stand by and fuse. Where is there a master volume? Just like this one, I own. Joe runs Celestion 80W speakers in his Tweed Twins. Sounds pretty good to me. Good for him, but not many (if any) of us get to play stages as big as the one's he does. Plus he has everything behind plexiglass shields. I need something a bit more practical than that. Ranster44, Scary Uncle G., supergenius365 and 3 others like this. I've got a device for that these days. BadHat, 71strat and PurpleJesus like this. 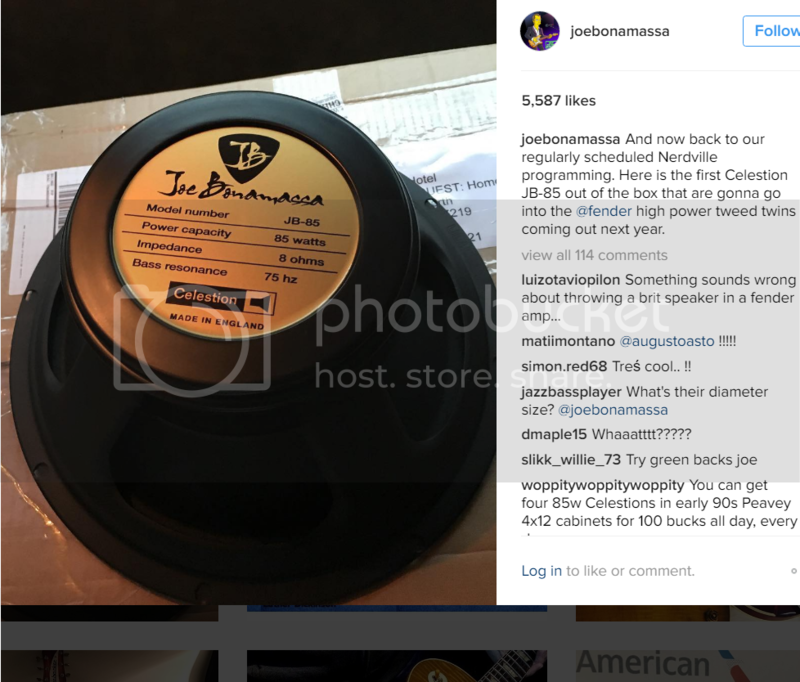 There is nothing unique about joe endorsing this amp, he will put his name on anything. It would be easier to find what he hasn't endorsed. If you want to sound like joe just buy this amp, said no one ever with any common sense. I mean if you are looking for a strat with a 12" fingerboard, large-ish frets and a light body shot with nitro do you say to yourself "oops can't buy an EJ strat because it's a signature guitar even though it's exactly what I want"? It says Fender Twin-Amp on it it's probably just a good amp but what do I know. Personally I buy sig gear if it's what I want and pretend it's not. Stratburst70, Family Man, Darkburst and 1 other person like this. He's got so much signature stuff, it's kinda pointless for anyone to ask for an autograph if you see him in person. In all seriousness - it's probably a great amp, but is going to command a ridiculous pricetag. It'll be interesting to see how the price compares to the EC Twinolux. Kelly and T92780 like this. Considering that they have never re-issued the high power Twin and prices for a vintage one are crazy, I don't see what Fender or Joe have to lose here. Rossi163, T92780, massacre and 5 others like this. I'm sure it's a well built, great sounding, HPTT......but it will be discontinued next year when he changes his amp of choice again.